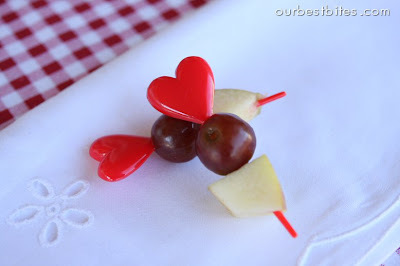 Home » Crafts, Sewing, & Home Decor » Mini Series » MINI SERIES with ‘Our Best Bites’: Serving up Kids Food! MINI SERIES with ‘Our Best Bites’: Serving up Kids Food! Ready for another great Kids in the Kitchen Mini Series post? In case you missed the first two, you can find them both here. Check them out……..you’ll be happy you did. Kate and Sara from “Our Best Bites” are bursting at the seams with great ideas. I love that they are hanging out here for a few more weeks. And today……it’s Sara sharing her brilliant ideas with us. Ack, love them all! Hey Make it and Love it peeps! I’m Sara from Our Best Bites and it’s good to be back this week! Okay, so do those of you with young kids at home sometimes feel like you’re in the movie Groundhog Day, re-living the same scene every day at lunch and dinner time? At our house we seem to live on an eternal lunch cycle of PJ&J, dino nuggets, hot dogs, and mac and cheese. Sometimes I have to kick myself to break out of the cycle! 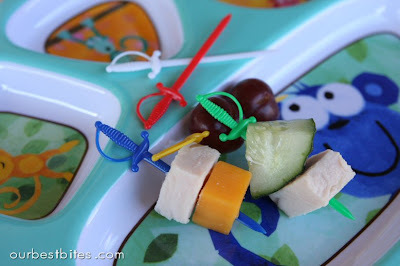 While I don’t think one should have to do cartwheels to get little kiddos to eat balanced meals, or try new foods, it does help to get creative every once and a while. Here are some of our best tips to get your little ones to eat their food and have fun doing it! One of my favorite tips came years ago on an on-line parenting forum when someone introduced me to muffin tin meals. Essentially, you’re just serving lunch in a muffin pan, filling each space with something different. Any old 6-cup muffin tin from your cupboard will work. At our house we love to use our fun silicone ones. As a Mom, it forces me to think of food groups and variety while I try to decide what to put in it. For the kids, it gives them something fun and different to do. My boys get excited with accomplishment every time they finish a little cup. One of my sons is in preschool right now, so sometimes we also try to find different colors to put in each spot, or things that start with certain letters. Another great tip is to make things their size! 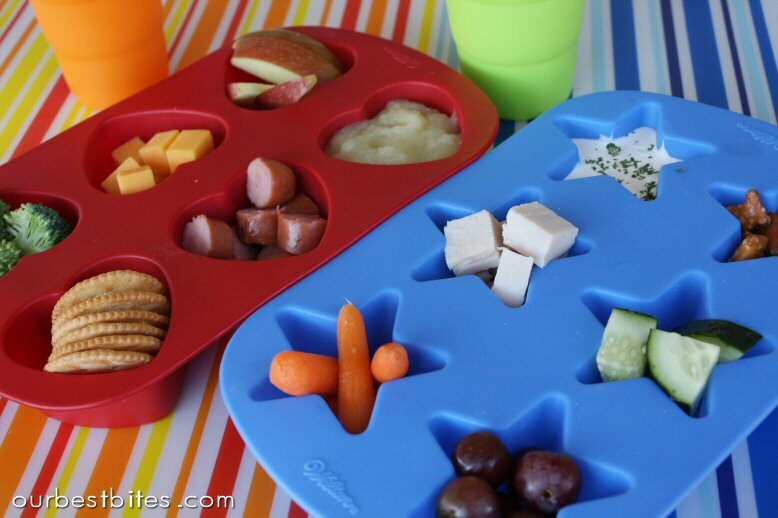 Besides being easier to eat and wasting less, kid-sized food is often more approachable for them. For example, try mini-pitas for sandwiches or personal sized pizzas. Or make soups and stews in little ramekins instead of bowls. 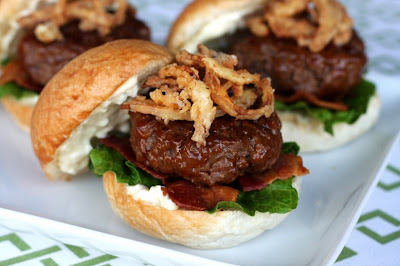 Also, try sliders instead of full-sized burgers. (Bonus: you get to eat 2 or 3!) These are one of our favorites; it’s the recipe that won us the Better Homes and Gardens Cook Off! Sometimes I don’t know why I even give my kids forks. I think it makes me feel more civilized or something. They usually end up eating with their hands anyway, so I like to try and make their food hand-held to begin with. One of our favorite ways to do that is with skewers. For little kiddos, try getting some fun party picks at the store. I just bought these darling Valentine ones too. They love trying to pick up their food with the pics and you can either toss them or wash and keep them when you’re finished. This one is especially helpful when introducing new foods. Stick a big plate of something new in front of a kid and there’s a high possibility they’ll turn their nose up at it. So instead, try it incorporated into something familiar. 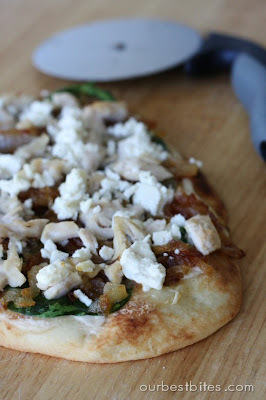 There’s no way in heck my kids would eat a spinach, caramelized onion, and feta salad, but when I stuck it on a piece of naan and baked it with a little alfredo (seriously, check out that alfredo, it will change your life) like a pizza they gobbled it right up. Because every kid knows pizza is awesome! 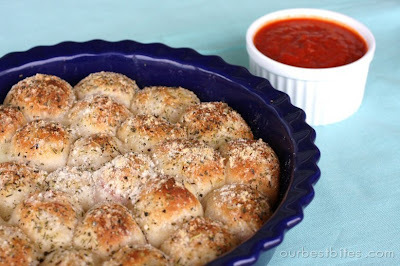 Another favorite of ours are these stuffed pizza rolls. Stick whatever you want inside and dip in the sauce to eat. You can even hide veggies in there! They’re perfectly kid-sized. 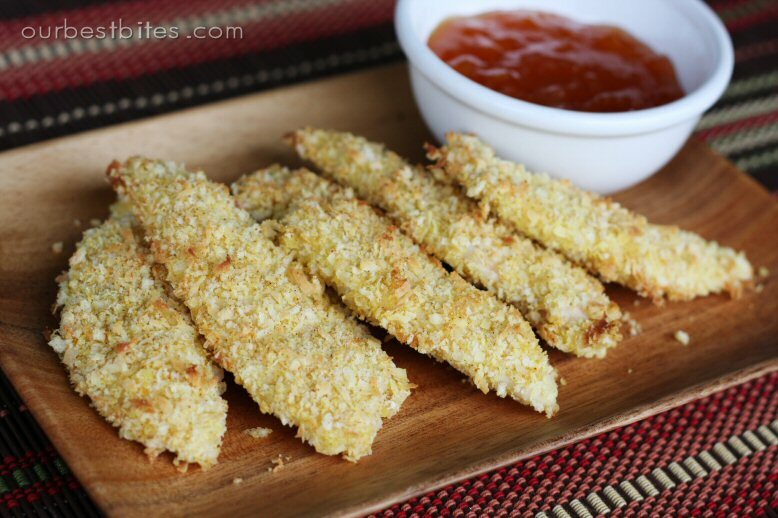 Flavors like curry and coconut are totally approachable when they’re in the form of a chicken finger. Kids can even dip them in familiar ranch dressing or ketchup. 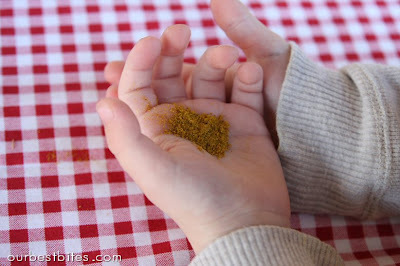 Try using new and interesting spices in the breading to expose your kids to new flavors. If I can turn anything into an animal or a funny face, my kids will eat it up. Octo-dogs for example Just slice your hot dogs into 8 pieces, but only half way up and boil until cooked. Pipe on a face with ketchup. We love these on mac and cheese! Cookie cutters are my best friends. Well not really, that would be pretty pathetic, honestly I have real friends. People friends. I swear! But you can cut all sorts of things with cookie cutters. We love making fun shapes with our sandwiches (and I can feed the scraps to my little one who doesn’t care about the shape!) Holiday shapes are especially fun, like halloween pumpkins, Valentine hearts, etc. I hope that encourages you to be a little creative in the kitchen! Sometimes that’s all it takes to turn picky eaters into excited ones!
. Click on any of the images below........and you will be directed to the full 'mini series' post. .
MINI SERIES with 'Our Best Bites': Fun with Kids Crafts in the Kitchen! Thank you so much for the tips! It's funny because I read this thinking, "Well, duh. Why didn't I think if this stuff?!" -it seems so obvious but I guess it really isn't! :) Thank you again…I love this series! My children just LOVE muffin tin lunches. We do them weekly. Thanks for sharing the other tips and recipes, we'll have to try them! some really great ideas! i make a lot of food scenes and faces myself it's amazing what kids will try if it's visually interesting! This is such an awesome post! These will be great for our daughter -in -law to tryout on our grandson. Really great tips. Love your blog and am so glad I found it. I make octopus hot dogs on top of macc-n-cheese for my 32 year old husband as a treat. We call it "King of the sea"
I love your blog and have chosen you for an award! Come visit me at http://chrystal-lewis.blogspot.com/2011/02/versatile-blogger-award.html to claim your award! Thank you for such cute ideas! Love them…posted over at the Herd about this and linked your blog! You guys are seriously geniuses! I can't get over how many awesome ideas you have! I'm loving your posts! 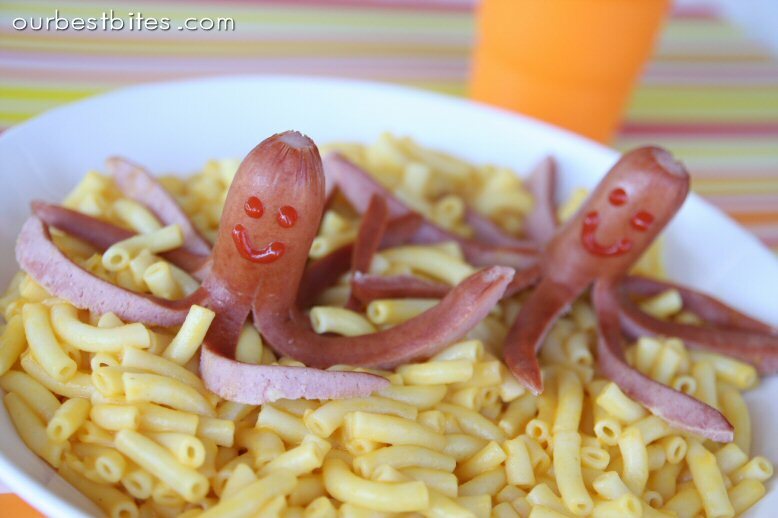 I have made the Octopus hot dogs and put them on a bed of seaweed…Ramen noodles colored green with food coloring. These are such great ideas! Thank you so much for sharing! Oh, my! I love the octo-dogs! I'm so doing that tomorrow! Had some fun making some felt food…. I just love the idea of serving food in silicone containers. It's just great.For super I will use this tip.Thanks a lot! Thank you, thank you, thank you! !